Courses are chosen to provide a broad background in neuroscience as well as to acquire the background necessary for the student’s specific research interests. In the first year, course selections are made in consultation with first year faculty advisors. For students on Graduate Program Committee Assistantships, first year faculty advisors are appointed by the associate dean of the Graduate School or by the Neuroscience Program. 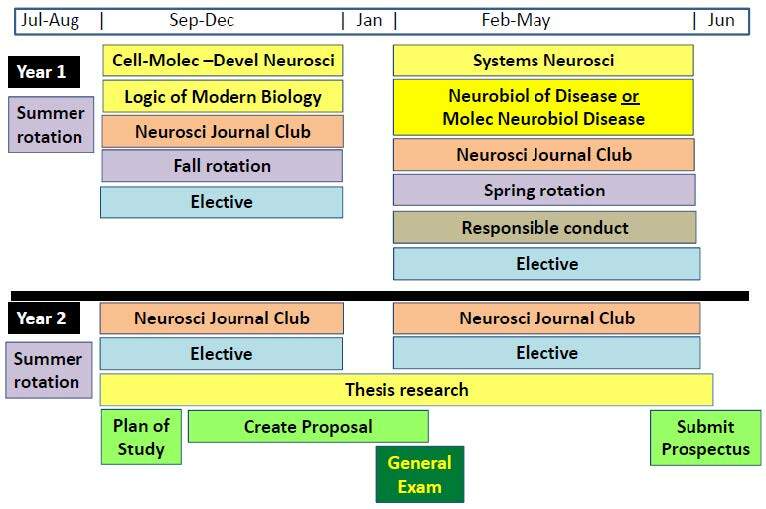 At the beginning of the second year, when students have chosen a laboratory for their thesis research, courses are selected in consultation with a student’s major (thesis) advisor. A suggested timeline summary for the first two years is shown below. The prospectus occurs in the third year. The third year and beyond are primarily devoted to laboratory research.